My father was a cameleer. We weren’t wealthy, but he prized education (probably because he himself was denied it) and recognised my gift for learning from a very early age. Consequently I ended up with a scholarship to study at the academy with other gifted young men, most of whom came from families who could easily afford the fees. I endured quite a bit of teasing during those years, most of it good natured, but some of it unkind. I was never allowed to forget my humble beginnings, nor the fact that I had to take a job during the evenings at a street stall in the bazaar to make ends meet. Eventually, as part of my studies, I found myself working with two other senior students on our astrology project, studying the stars. The night work interfered with my work in the bazaar, but it was too important to miss. It was only later that I discovered how important. As I said, teasing from my fellow students could be good natured or unkind. In this case it was definitely unkind. On one of my nightly shifts I had observed a new, bright star in the western sky. I was excited, because I knew it was significant. I duly reported it to the others, who took the information to our professor, claiming it to be their discovery. I was hurt and angry, but could say nothing. After all, being a scholarship student, my place at the academy was tenuous, and I didn’t want to create a sandstorm. After much discussion between the professor and the other two, the meaning of this new star became apparent – it signified the birth of an extremely important personage, probably a king, or a high priest. Consequently they were given leave to follow wherever it led. Since the reputation of the academy was at stake, these two were given gifts to offer this high and holy person when they found him – gold (for a king), frankincense (for a priest) and myrrh (for a royal embalming at his death). 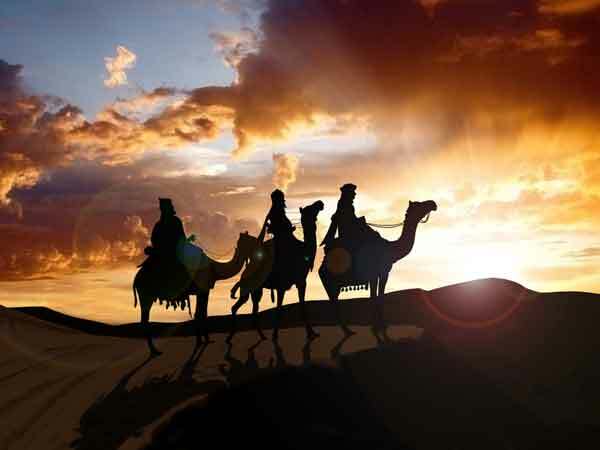 However because there were three gifts, and only two of them, the professor suggested that I should tag along: mainly because I knew my way around camels and they didn’t, as well as to carry this third gift – which, by the way, they deemed to be far less important than the gold and frankincense. And so we set out late one evening, avoiding the daytime heat of the desert, and headed west towards this brilliance, which hovered enticingly in the night sky. I thought we would make the journey in a few days, but it dragged on and on. At first the other two boasted of their being chosen for the task, and talked of how meeting this king would improve their status among their social set, but as time went on, they became more ill tempered than the camels. In fact if I had the choice, I’d have preferred the company of the camels. At least I understood them, and they respected me. Each time we entered a village, I would be sent off to the local bazaar to buy food, while they basked in the admiration of the locals who came to gawk at their finery – their expensive robes and turbans, and the jewels in the bridles of their camels. Mixing with the street people was a relief for me, because, as with the camels, I knew my way around bazaars and could barter with the best of them. After about three months we came to Jerusalem, the city of the Jews, but ruled by a despot appointed by Rome. Since we were in search of a king and as a courtesy we sought an audience with King Herod, and to enquire as to whether he might know of the whereabouts of this new king. It was clear that I should stay in the background in the guise of a servant, which was fine by me. Royalty made me nervous. Especially this royalty. Having asked his own wise men about where we could find our king (which turned out to be Bethlehem), Herod pleaded for us to return and tell him where we found him, so he could also pay homage. Once we left the palace I uncharacteristically spoke up. This was too important to keep to myself. “Herod wants to kill the new king. That’s why he asked us to return and tell him where he is.” At first the others were sceptical, and scoffed, but I persisted, becoming increasingly agitated. “Don’t you see? That’s what the third gift is about – the myrrh. It’s not just an expensive ointment to boost our reputation. It’s about sacrifice and death. Don’t you get it?” To their credit, the other two didn’t argue any further, but clearly needed to chew this new concept over. Come to think of it, so did I. My outburst surprised even me, as I hadn’t thought about the third gift in this way before. We continued on to Bethlehem, sure that we were coming to the end of our quest, but were disappointed. I was sent to talk to the locals, and it took some time before I found someone (a distant cousin I think) who informed me that the family had returned to Nazareth a few weeks earlier. So after resting the camels and spending the next night and day there, we headed north to that town. Strangely, the star was still there, leading us on. I noticed along the way that this setback didn’t incur the usual repercussions. My two companions were neither irritated nor angry, but travelled in silence. If they spoke to me, it was with more civility, for which I was grateful. We arrived at Nazareth a couple of days later, early in the morning. I knew that the women would be drawing water from the well at that time of the day, and if there was any gossip to be had that’s where I’d find it. So I made my enquiries. We finally tracked down the modest house and introduced ourselves to the family, a carpenter and his wife, and their baby, about nine months old. I wondered how my companions would cope with the poverty (in comparison to their wealth) of the place, which seemed in direct contrast to the palace they expected. But they were there to represent the esteem of to the academy, so they dutifully offered their gifts, and stepped back. Then it was my turn. I carefully laid my gift of myrrh with the others before this little boy, who began to play with the bejewelled casket. I touch his hand, and he took hold of my thumb and giggled. I asked if I could hold him, and as I did, I remembered my little brother, and how I used to lay him down to sleep while my mother was busy with the younger baby. This little heart-breaker played with the woven tassels on my rough cameleer’s robe and we talked baby talk together. But the others were anxious to go, so I reluctantly had to take my leave. Amazingly, my companions took my advice and agreed not to return via Herod, so we skirted Jerusalem, preferring to take a lesser known route. Our journey back home was much more pleasant for me. The other two no longer bragged or lorded it over me. They once even offered to help me with the camels – an offer I politely declined, mainly because I couldn’t afford the risk of them bolting, and I didn’t want to spend the next day and a half chasing them all over the desert (although I didn’t tell my companions that). I found myself being included in the conversation around the campfire, and was surprised to hear how much our encounter with the child had touched them. They struggled with the seeming paradox of poverty and kingship, and yet intuitively understood that it was important in some way. I don’t know whether I helped them in our discussions, but I know that it presented no problems for me. I suppose it was because I was at home in such a place, and could wonder at the fact that such a king would actually delight in being there. The fact that he was so small and innocent and helpless drew me even closer to him. So often I had felt that way in my life, and I reasoned that here was someone who would understand and accept me in a way that the others didn’t. When we returned to the academy, I expected to be left to tend to the camels while the others told their epic story, but much to my surprise, they waited until I had finished my work before reporting to the professor. What’s more, they acknowledged my skills that made the journey possible, and (wonder of wonders!) asked me to present my interpretation of our encounter with the new king. Life at the academy has changed little since we got back. I still endure the banter, but seem to have gained the respect of my two companions, who will often defend me. I sometimes wonder what became of the new king. I somehow couldn’t envisage him on a big throne like Herod, lording it over his subjects. His way of ruling seemed to be wrapped up in love, the kind that would draw people to him, as it did me. I also wonder what became of my gift of myrrh, whether it was actually used, and that fills me with sadness. But since death is a fact of life, it also fills me with hope, since my king (yes, I have come to call him ‘my’ king) sees fit to experience all my pain and sorrow, and therefore understands my own. And so I live in hope that someday I, Melchior, will see him again.